MUSSELBURGH snooker star Ross Muir won a last-frame decider to beat Glasgow’s Dylan Craig in the final of Event 4 of the Scottish Under-21 Series in Falkirk. Muir, 17, lost the first two frames, but won a long drawn out third frame before levelling the match at 2-2 at the interval. Muir took the fifth frame, but Craig won a respotted black to level the match again at 3-3. 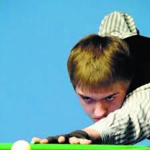 However, Muir won the decider to ensure that he would increase his lead at the top of the Under-21 snooker rankings. Leslie lost 5-2 to England’s Ian Burns. The Bonnyrigg player recovered from losing the first frame on the black by making a 51 break in the second frame, but Burns, who reached the quarter-finals of the Scottish Open in Ravenscraig last month, restored his lead with a break of 90. Leslie levelled the match again with a run of 48, however, Burns made breaks of 48, 36 and 39 to win the match 5-2. Donaldson lost 5-4 to China’s Chen Zhe.